Wood warps from exposure to moisture which curves plywood or boards for sub-flooring or framing a home. As humidity or moisture from rain water falls onto the wood, the lumber absorbs the liquid causing it to expand and bend. Using warped planks in framing a home or in a sub-floor may result in problems as floors and walls begin to buckle. Flatten warped wood before starting a project to avoid problems down the road. Flatten warped wood with compression. Dry the warped wood with old towels. Lay wood planks in a dry area of the garage or shed. Avoid placing the wood on grass or a dirt surface; lay it onto dry concrete. Stack concrete blocks across the top of the wood. 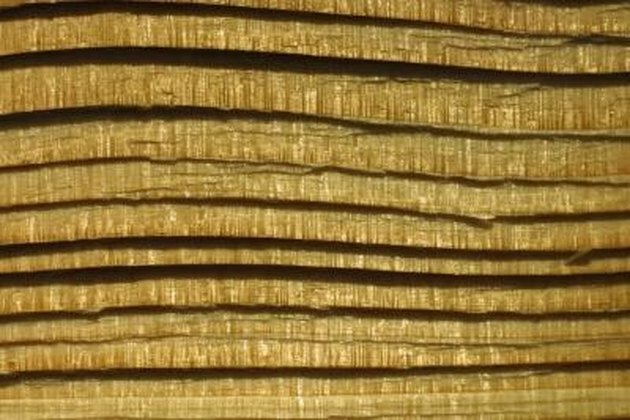 Stack an extra block on each end of a warped board, or all four ends of a piece of plywood. Allow the blocks to remain on the board for three to four days. Remove the blocks from the wood and check for warping. Heat an iron to high heat. If the warp remains, glide the iron over the convex, or humped side of the board. Work the iron slowly over the warped area, allowing the heat from the iron to pull moisture from the wood. Iron the area for two to three minutes. Soak a towel with hot water and squeeze out the excess liquid. Turn the wood over and lay the hot towel over the concave or sunken area. Place plastic sheeting or plastic wrap over the towel to hold in the moisture. Allow the towel to remain overnight. Remove the plastic and towel the next day. Check the wood for warping and repeat the compression process if it remains.